Unless you possess nearly superhuman amounts of willpower and discipline, odds are you have had the experience of standing in a checkout line and finding yourself tossing an item or two into your cart that wasn’t on your shopping list, just because it was displayed in a fashion that caught your eye. These point-of-purchase (POP) displays are an invaluable tool for prompting customers to purchase products that they hadn’t even known they wanted, on top of the items they came into the store to buy. The checkout area is the one area of a store where you have a captive audience. Not only are consumers herded into this specific place to complete their transaction, but they are often desperate to have something – anything – to look at while they wait. A conspicuous and appealing display at the point of purchase is a perfect place for them to rest their eyes, and from there it’s a small step to picking up the items and tossing them into their cart. Furthermore, though it’s rarely remarked upon, displays set up at the point of sale create a sense of urgency for the customer. Rather than having the time to ponder and potentially reconsider buying the displayed product as they do while browsing in other parts of the store, customers waiting to check out don’t want to hold up the line while they critically evaluate whether they really need the item that, by this point, is likely in their hand. Products displayed at the point of purchase require a snap decision, which frequently works in your favor. There is a science to the design and placement of POP displays that marketing consultants charge beaucoup bucks to share, but you can maximize the potential of these displays with a little of your own research. Visit stores that carry your product and pick the managers’ brains for ways they’ve displayed and promoted your product. With that information, you’ll be able to create the most successful POP display for each item and provide it to retailers along with an instructive plan for its placement. Don’t overlook the valuable resource represented by the contract packaging company you’ll be using to produce your POP displays, either. 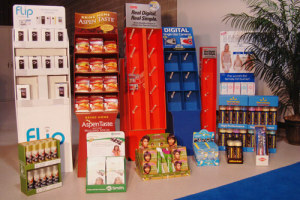 A knowledgeable fulfillment company with experience in the design and production of point-of-purchase displays can provide peerless advice about which style of display (e.g., a floor display versus a counter display) and which design features (how many sides of the display should be merchandised, etc.) would best highlight your product. With their help, you can be assured of increasing your sales with a POP display that really pops!